7.1 Apple snail laid eggs – what should I do? 7.2 Apple snail doesn’t move – what has happened? 7.3 I have some vegetables to feed snails, but the vegetables bob up – what should I do? 7.4 Do apple snails eat aquarium plants? 7.5 Do apple snails breed fast? How to control this process? 7.6 Do apple snails need some special place for breeding ? 7.7 My apple snail is very large. How more will it grow? 7.8 My apple snail has some of its body parts torn off – what should I do? 7.9 Apple snails in brackish water – how do they stand it? 7.10 Do apple snails carry disease or parasites? 7.11 Do apple snails go dormant? 7.12 Why is my apple snails shell of different color in some areas? 7.13 My apple snails shell is cracked. Why so? 7.14 Apple snail empty shell in a tank – has somone eaten it? 7.15 What is apple snail lifespan? 7.16 Can apple snails live in ponds? 7.17 My apple snails aren’t active, they often stay eithout any movements. I feed them well, the living conditions are good. 7.18 My apple snail has risen to water surface and swims there? Is it dead? 7.19 What is apple snails hatching time? 7.20 How often do apple snails breed? Do they breed all year round? Came from the river Amazon where it inhabits all along the river. Some time later the snails spread to Hawaii, South-West Asia and even Florida. In the wild spend most of their life in water and they get out of it only accidentally or during their breeding period to lay the eggs. Still, although they spend the majority of time under the water, they need some atmospheric oxygen to breathe and they go up to the water surface to get it. Apple snail is capable to get oxygen both from atmospheric air and from water. To do this it uses a special cavity divided with a partition: one part of the cavity is like fish grill and it’s used to breathe oxygen dissolved in water and the other part is similar to lungs. When reaching water surface the shellfish makes sure that it’s safe and opens its breathing tube (siphon – that is an elongated part of its pallium), and pumps the air inside the lung with rhythmic movements of all its body. An adult snail’s siphon can be about 9-10 cm (4 in) long and the snail itself is rather large. The shell diameter can be up to 7 cm and its “leg” length – 8-10 cm (3-4 in) and width – up to 4 cm (1,57 in). On a snail’s head there are yellowish eyes and two pairs of sense bristles. Apple snail has very sharp olfaction. That’s why they can smell the feed appearance and surprisingly quickly get to it. Though, the most common coloring of gold snails is yellow, nevertheless there rather many other colorings. Except, snail one may see white, brown and almost black species. It’s important to remember when you buy an snail that it’s going to grow larger than common snails. Snails are sold being quite small (about 2.5 cm or 1 inch in diameter), but they may grow to be up to 8-10 cm (3-4 in). There are even larger species which were fed well and they become so large that they can even compete in size with another giant snails – marisa snails. If these snails are kept alone, a quite small tank will be enough for them – about 10 gallons capacity. Since they eat a lot of feed and there are a lot of leftovers, it’d be wise to give not less than 2-2,5 gallons of tank volume for each snail. Taking into account the fact that breeding is rather fast thing, it’s not recommended to have a lot of them in a tank. Since, it happens rather seldom when are kept without any tank mates in a tank, it’s better to expect the tank to be large. Because, for 3-4 snails plus some fishes you’ll already need a tank about 20 gallons capacity. Of course, everything depend on your personal conditions and details. But the rule – 2 gallons for one snail won’t let you down when counting a tank size. It’s very easy to feed these snails, since they eat almost any type of feed. Besides, that they will eat all the feed that you give, they’ll feed on everything they will be able to find in a tank. The plus of such behavior is that apple snail will eat the leftovers after other tank inhabitants’ meal and these leftovers won’t stay on the bottom and rot spoiling the tank water. The easiest way to feed the snails is with catfish feed tablets and vegetables. Cucumber, squash, lettuce and even pumpkin are these snails favorite meal. However, two things should be done for sure – boil the vegetables for about couple of minutes before giving them to snail and don’t leave the vegetables in a tank for over a day since the water gets very muddy. Snail eagerly feeds on live feed – blood worm, tubifex. But they require a clean bottom to get to such feed and in a community tank the feed usually has a chance to fall on the tank bottom. Unlike the majority of tank snails, apple snails aren’t hermaphrodite species and you’ll need a male and female snail for successful breeding. The best way to get such a couple of snails is to buy 3 snails right away, which almost guarantees that a male and female will be among the bought snails. When the snails become reproductive, they’ll start breeding themselves – you don’t need to do anything to stimulate them. How to get that the breeding process is on? During this period male and female snails will join each other and the male snail is always on top. After the breeding is over the female snail gets out of the tank water and lays a big number of eggs above the water surface. By the way, this way they very often get out of the tank and die. So, cover the tank with a lid! Their eggs are of pale pink color and it has to be above the water not drowning into it, since this way the eggs will die. Their surface calcinates under the influence of air and baby snails become completely safe. Small snails appear in a few weeks at the condition that outside temperature is 5–81 °F (24–27 °C) and it’s humid enough. Newborn apple snails are rather large, fully-fledged and they don’t need any special care. They are totally peaceful, they never deal with fishes or spineless species in a tank. There’s a misthought that they attack fish. But it has occurred because snail is a scavenger and they feed on dead fish and it looks like the snail has killed the fish. There’s no snail capable to chase, catch and kill a healthy and active fish. However, fishes don’t leave the snails alone. Fishes can tear snail’s horns as, for example, tiger barbs do or even kill snails as pufferfish, freshwater clown fish and large cichlid fishes. Some fishes can’t eat large snails, but they’ll totally destroy snail juveniles. Such fishes will bite large snail species whenever possibly, that is still rather bad for them. Spineless species such as prawns and crawfish may also become a problem, because they are perfectly good at pulling out snails from their shells. Apple snail laid eggs – what should I do? If you are ok with the fact that the snails will get into a community tank – so, don’t do anything. At constant humidity and temperature the snail juveniles will appear from eggs themselves, they will get into the water and start living on their own. It’s not a problem to take the juveniles out of the tank, but if you like you can put some plastic bottle as an incubator for snails eggs and small snails will fall into it and you’ll be able to take them to the community tank. Apple snail doesn’t move – what has happened? It’s more likely that the snail is dead, at least if it hasn’t been moving for over several days. The easiest way to check it is to smell the snail, but carefully since the smell may be rather strong. Dead snails should be removed from the tank, because they decay very fast and spoil the water. I have some vegetables to feed snails, but the vegetables bob up – what should I do? Everything is very simple, pin a piece of vegetables on a fork or any stainless object. Do apple snails eat aquarium plants? Yes, some snail species may feed on tank plants, especially if they are hungry. How to avoid this? Feed the snails to the full. I’d like to have some apple snails in my tank. Can grow to over two inches in diameter as fully grown adults! Cleans aquariums by eating uneaten fish food and other waste. Do apple snails breed fast? How to control this process? This isn’t a problem at all. Firstly, the snails eggs are large and they are somewhere above the water, so it’s rather hard not to see them. Secondly, the snail juveniles are rather large and you can take them out of the tank with your hands. Do apple snails need some special place for breeding ? It’s quite enough for the tank to be closed. There is an ideal place for the eggs in the space between the tank lid and water. And again, it’s better to close the lid, since apple snails may get out of the tank. My apple snail is very large. How more will it grow? Provided with good feed apple snail species of Pomacea maculata kind may grow to be 15 cm (6 in) in diameter. But, usually the are about 5-8 cm in diameter. My apple snail has some of its body parts torn off – what should I do? It’s ok, these snails have a wonderful regenerative capability. As a rule, the lost organ will grow back in about 25 days. It can be a bit smaller in size, but it’ll be completely working. These snails are even capable to regenerate their eyes. Apple snails in brackish water – how do they stand it? If salt concentration is risen gradually, the snails are capable to stand a bit brackish water. If while raising salt concentration the snail stopped getting out of its shell, then hurry to decrease the salt level in the water. Do apple snails carry disease or parasites? Yes, they do. There are several types of parasites for which the snails are carriers. However, the snails fight these parasites rather well, since apple snails are much more enduring then they are. There is one parasite which is dangerous for human and it is nematode (Angiostrongylus cantonensis). Rats are the main circulators of infection and human can get infected if he or she eats raw snails. Very seldom this parasite causes nervous system injury and even death. But still, there’s nothing to be afraid of, since apple snails can get infected with this parasite only in the wild where their neighbours are infected gnawing animals. It’s hard to imagine that local snails bred in aquariums could possibly have any contact with such animals. And even though we imagine that this happened, you’ll still have to eat this raw snail to get infected. Do apple snails go dormant? Yes, some species do during the dry season in the wild. But in the tank there’s no need for apple snails to do this. Why is my apple snails shell of different color in some areas? This happens because at some moment of time the snail stopped growing (the change of habitat, lack of food, change of water parameters) and once all became ok the snail recovered the previous state of its shell. But the marks were left on the shell. It’s ok, the maim thing now is to further provide the snail with good living conditions. My apple snails shell is cracked. Why so? To form their shells apple snails get calcium from water. If you have very old or very soft water, the reason of this problem may be just lack of calcium in the tank water and the snail’s protection, it’s shell, gets cracked. This can be easily fixed, at least you can change some amount of water in the tank or to put some mineral substances into it to make the water more hard. But please keep in mind, that the snails can plug up holes in their shells, but if the tip of their shell disappears it can’t be regenerated. However, the snails can quite live with that. Apple snail empty shell in a tank – has somone eaten it? It’s very likely that the snail died itself. See the kinds of fishes that feed on snails mentioned above. But of the snail died itself, it decays very fast, since it’s all protein. 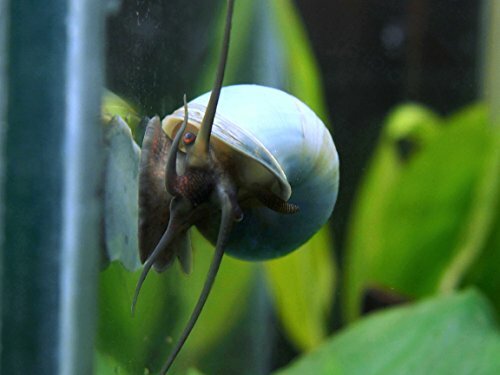 These mystery snails are a calming sky blue color, and make a beautiful and elegant addition to any aquarium. What is apple snail lifespan? It highly depends on the snail tank conditions and temperature. 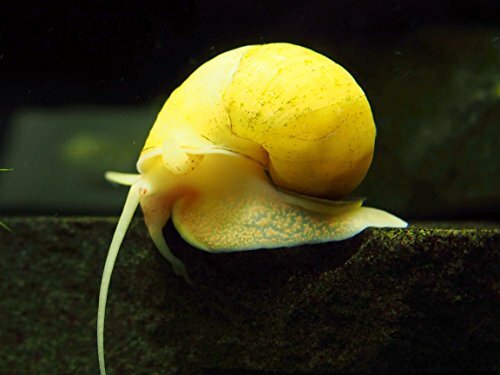 At low temperature golden apple snails live up to 3 years, at temperature from 25°C (77 F) the snail lives only about 12-16 month. At higher temperatures apple snails are more active, they grow faster and breed. However, the side effect of such living conditions is accelerated metabolism and, correspondingly, early death. Temperature for keeping apple snails may vary from 18 – 28°C. Can apple snails live in ponds? Sure they can during the summer, since they can live at temperature 18-28°C. However, in winter, you see…. My apple snails aren’t active, they often stay eithout any movements. I feed them well, the living conditions are good. If the snails aren’t dead (see above how to check this), than it’s ok. The snails themselves are very lazy creatures and they have only two desires to eat or to breed. Correspondingly, if they don’t want anything from these two points – they sleep. Or it’s possible that your tank temperature is low, as we mentioned above. My apple snail has risen to water surface and swims there? Is it dead? It’s not for sure, since as it was mentioned above, the snails are lazy enough and because of the fact that they breathe with air which they pump up under their shell, it means that it’s quite possible that they can rise up to the water surface. It’s easy to see if something is wrong with the snail – take it out of the water and if it quickly closes the shell, then it’s quite fine. If the snail is dead, its muscles get relaxed and the snail doesn’t move. What is apple snails hatching time? It is from 2 to 4 weeks, depending on the temperature and humidity. How often do apple snails breed? Do they breed all year round? Yes, they breed all year round, but significantly less in winter.